Nice contrast against dark evergreens. Use in mass plantings or as a border. Nandina domestica or ‘Heavenly Bamboo’ gets its name from the fine textured leaflets that resembles bamboo foliage. Nandina adds interest to the garden in all four seasons. 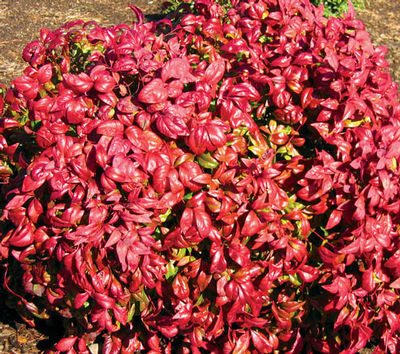 New growth in the spring is copper to red and burgundy that matures to dark blue green in summer. Pinkish buds open to creamy white flowers borne on erect, 8” to 15” long panicles in May and June. As the fall approaches the leaves take on a lighter shade of green, clusters of green berries ripen in September and October to a bright red. The fall foliage begins to change to shades of pink and red ending the seasons with red foliage and bright red berries. Berries persist long into winter making them attractive to birds. Upright grower can be planted in partial shade however for optimum color plant in full sun.